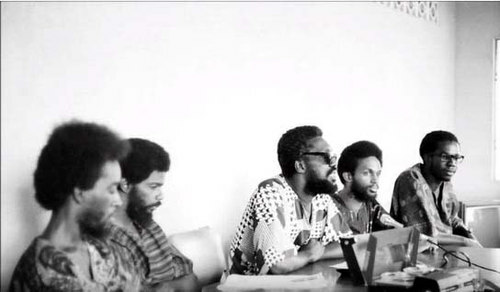 Today, 21 April, 2017, marks the 47th anniversary of the Trinidad and Tobago Revolution of 1970, led by the National Joint Action Committee for a New and Just Society in Trinidad and Tobago. Under the astute leadership of the late Chief Servant Makandal Daaga, the people’s movement emphasised the absolute importance of the principles of mobilization, consultation and participation in the process of nation building. The movement recognised the absolute necessity of the broad-based involvement of the population in the building of any truly just society. 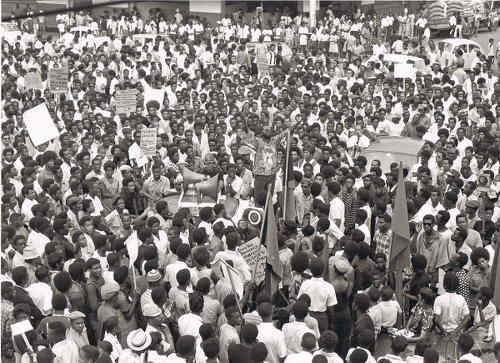 Photo: NJAC chief servant Makandal Daaga addresses the crowd in Port of Spain on 21 April 1970. The period 26 February to 21 April, 1970 witnessed the most comprehensive mass mobilisation in our history. It was a revolutionary experience which was based on the mass education of the people and in their participation in the decision making processes. 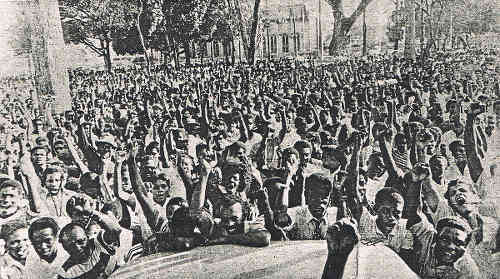 Mass public meetings and demonstrations were held throughout Trinidad as well as Tobago to inform and mobilise the population. These measures, along with the publication of a host of pamphlets and the circulation of vast numbers of books covering very diverse topics, ushered in a new consciousness. 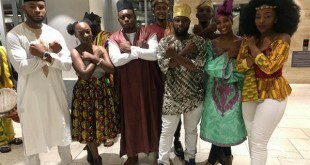 It was a consciousness which restored African pride, whilst enhancing the appreciation and pride of Indian and other groupings in their heritage. There were also strong elements of national and Caribbean consciousness. When Trinidad and Tobago became independent, the menace of racism was still very prominent. Social and economic status, educational and employment opportunities as well as access to fair and equal treatment by law enforcement agencies and the judiciary were still largely determined by race and colour. Race had a dominant influence on the dignity and respect one enjoyed. The rise of the new consciousness went a long way in restoring a sense of humanity and pride among both the African and Indian sectors of our population. It curtailed the overbearing inferiority complexes which dominated the lives of the vast majority of our citizens during the pre-1970 period. Some deep psychological wounds, however, still remain and we have much ground to cover, both as a nation and within the global community. The movement’s pursuit of justice and equality induced favourable conditions for greater human dignity, self-respect and cultural appreciation. For instance, in an interview in the documentary “70: Remembering a Revolution,” Professor John La Guerre stated that among the Indian sector of our population there was a resurgence of pride in and practice of their traditions and culture. The mass demonstrations which crisscrossed our nation did more than win support for the cause. They also exposed the conditions of life in different parts of the country, giving rise to a better understanding and appreciation of each one for the other. 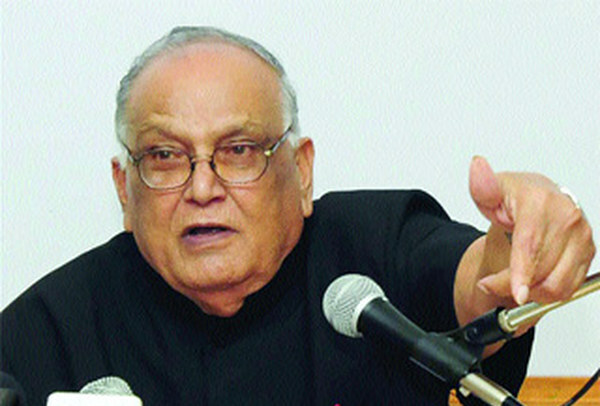 This led to bonds of solidarity within the population, thus cementing the sense of “Brotherhood” and “Sisterhood” as enunciated in NJAC’s Principles for the New Society. The family was extended to incorporate the entire nation as the movement promoted the harmony which is so integral to the building of a united nation. 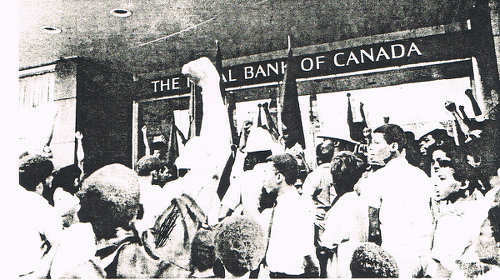 Photo: A public demonstration outside of the Royal Bank of Canada in 1970. 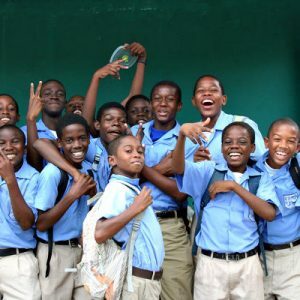 • In Tobago, which was an agricultural economy, 71 per cent of the best land was owned by either foreigners or a small local elite. Nationalisation of Tate & Lyle to become Caroni 1975 (Trinidad) Limited. This was in keeping with a decision made at a People’s Parliament held at the Couva Car Park on 12 March, 1970. Curtailment of the then prevailing stigma that “black people can’t run business,” which led to the expansion of the small business sector. This gave rise to the creation of the “Drag Brothers,” initially located on Frederick Street and then evolving into the “People’s Mall,” first housed on Queen Street and now on Independence Square. The economic achievements outlined here opened up new opportunities in both the private and public sectors. Previously locked doors were now opened to those who could only have dreamt of a managerial position in the period prior to 1970. 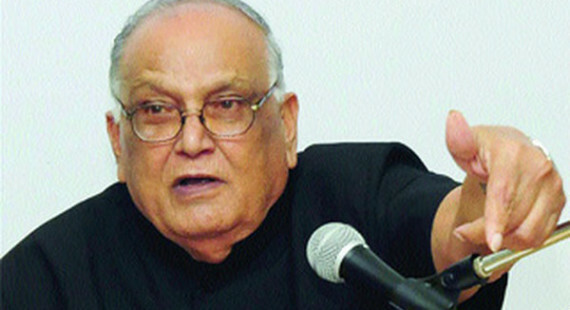 The “March to Caroni” was the most powerful display of the possibilities of national unity since the era of Tubal Uriah “Buzz” Butler. 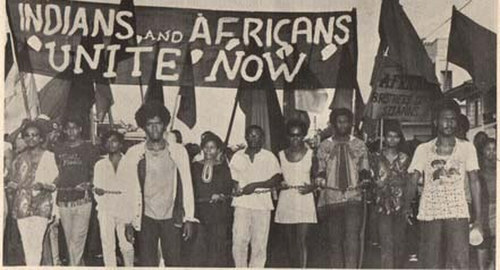 Demonstrators were welcomed with refreshments by the Indian population and, in a massive show of brotherly love, the residents of Couva opened their homes to those demonstrators who could not get back to north Trinidad. 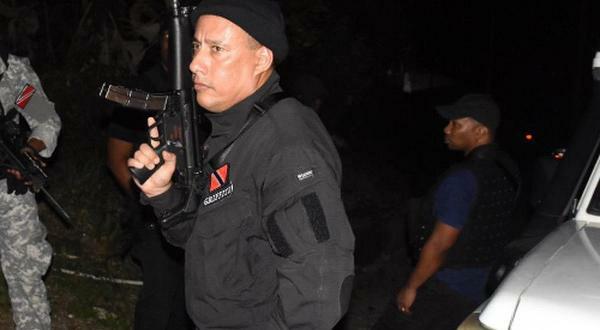 Most significantly, a state of emergency was declared on Tuesday 21 April, the day of the planned return march of the Indians into Port of Spain. The leaders of the movement were arrested and detained on Nelson Island and the Royal Jail under the emergency powers. As we remember those historic days in our fight for peoplehood, we must unearth their relevance to the present situation. Our people live in grave trauma today, as the nation seems to be adrift in treacherous waters. By comparison, the confident cries of the masses for “Power to the People” have given way to a resignation to the worst while we hope for the best. The greetings of “Brother” and “Sister” have been replaced by the “borderline” and a determination to hurt, maim and destroy each other. While 1970 witnessed an unprecedented 56% reduction in crime, we now witness a diametrically opposed reality, where crime has assumed frightening proportions and our nation seems to be at a total loss as the grip of this scourge suffocates our people. Let us be inspired and guided by this watershed moment in our nation’s history to earnestly face our nation’s current challenges. For our own survival, we must discard the pettiness from among us and consciously aspire to the ideal of “one people, one nation”. 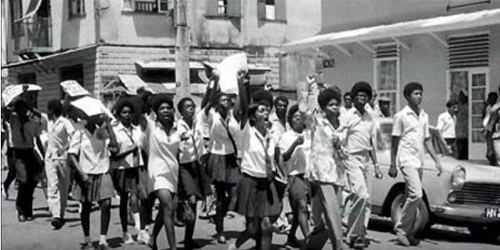 Photo: A demonstration at Woodford Square during the Trinidad and Tobago Revolution of 1970. 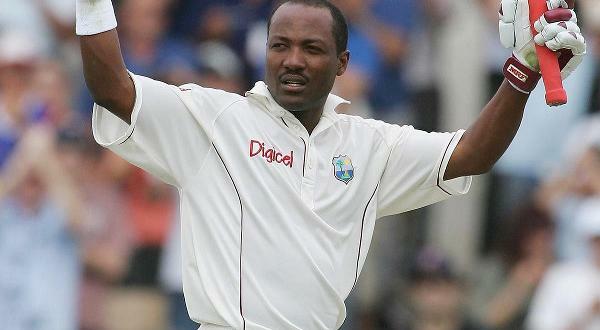 MASTER’S VOICE: T&T must show respect for Makandal Daaga… and here’s why!